Supervisory Control and Data Acquisition (SCADA) is the combination of telemetry and data acquisition. Supervisory Control and Data Acquisition system is compose of collecting of the information, transferring it to the central site, carrying out any necessary analysis and control and then displaying that information on the operator screens. Encryption Schemes are needed to secure communication in SCADA Systems. In the case of Symmetric key encryption, a secret key, which can be a number, a word, or just a string of random letters, is applied to the text of a message to change the content in a particular way. While in the case of Asymmetric Encryption, two keys are used. A public key is made freely available to anyone who might want to send you a message. A second, private key is kept secret, so that only you know it. These schemes can be integrated to SCADA communication for managing security level. 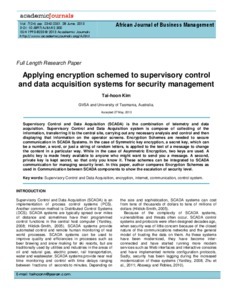 In this paper, author compares Encryption Schemes as used in Communication between SCADA components to show the escalation of security level.